From left, Jenelsy Lopez, Hassana Arbubakrr, Alexus Mitchell, E'Sachi Smalls and Angie Jimenez at the ABC House in Darien on Jan. 25. DARIEN — Transitioning from middle school to high school is pretty difficult. But Darien High School freshmen Alexus Mitchell and Hassana Arbubakrr have handled it pretty well. Mitchell was on the cheerleading team this fall and is now cast in the school musical “Legally Blonde.” She’s in four dance numbers, including one where she has to jump rope and sing. Arbubakrr was elected to Community Council and plays on the varsity and junior varsity basketball teams. In the fall, she played on the volleyball team. Unlike their classmates making the same transition, the girls are living away from home. They’re two of five girls living at the ABC House in Darien. 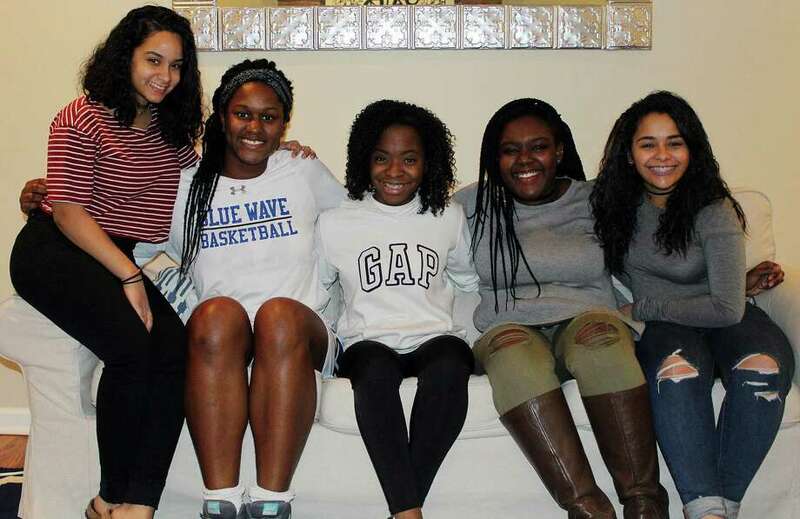 ABC stands for “A Better Chance,” a program that allows up to eight girls of color from the tri-state area to board in Darien and attend the high school. Right now, there are five girls living in the ABC House, a four-bedroom, four-bath home: junior Jenelsy Lopez, sophomores E’Sachi Smalls and Angie Jimenez and Arbubakrr and Mitchell, the freshmen. They live with Beth and Peter Horan, a nurse and aspiring math teacher, who act as resident directors of the home. The Horans live in a downstairs apartment. They have four children, all graduates of Darien High School, and had sold their Darien home and moved to Milford for 10 months before they decided to come back for the opportunity to be resident directors this past fall. “For us, it’s a total privilege for us to be here,” Beth Horan said. In addition to making sure the girls make the bus, do their chores and are ready for mandatory study time after dinner, the Horans take the girls on road trips. So far this school year, they’ve gone on a rafting trip in Pennsylvania, visited Roger Williams Zoo and Providence College in Rhode Island and went to New York City to see a Broadway show, walk the Brooklyn Bridge and make tacos at the Horans’ daughter’s apartment. They even organized a massive mannequin challenge on the subway. “We’ve enjoyed the activities we’ve done together,” Peter Horan said. “These guys are so game for road trips,” Beth Horan said. The girls spend a lot of time with the Horans. As scholarship students (the ABC House covers all the girls’ expenses with a community-funded budget of $170,000), they have strict study schedules and requirements for after school activities. But with teen drinking being prominent in Darien, they also have to be careful with whom they socialize. What might be a typical party for some high school students could mean being sent home for the girls. The consequences if they get caught drinking aren’t the only things that distinguish the girls from their classmates. The girls are minorities in a town that’s over 95 percent white. They all hail from the Bronx, N.Y., (with the exception of Arbubakrr, who is a New Jersey resident). This draws some curiosity from their classmates. This is just one example of stereotypes their classmates might believe, many perpetuated through social media. The girls don’t mind the curiosity, but want people to know not to believe everything they see. For Lopez, she’s found people ask about her hair after she’s gotten it straightened when she goes home for the weekend. Lopez has also picked up some of the culture in Darien. “The way people dress is different and makes us look different,” Lopez said, noting her freshman year, she noticed everyone wore white shorts and rainbow sandals from Darien Sport Shop. “Over time, I started to wear some of the same stuff,” she said, admitting she now owns her own pair of rainbow sandals. The girls admit they came to Darien with their own ideas about the town, many of which were debunked. “I thought in Darien, people listened to Katy Perry,” Jimenez said. “But I came here and found out they listen to Kanye. The girls experienced culture shock from having grown up in an urban environment. They remarked on how quiet the town is and how different it is for them to not be able to hop on the subway to get around. The town is a lot smaller than what they’re used to and admittedly more homogenous. But overall, the girls have found a warm welcome in Darien and embraced the community. Smalls plays volleyball and interns at E.C. Scott Group in Darien, while Lopez works at Palmer’s. Jimenez cheerleads, plays the clarinet, manages the softball team and volunteers at Norwalk Animal Hospital. Se and Lopez also volunteer at Person-to-Person. Both the Horans and Yvette Eenkema vanDijk, co-president of the program, said they feel the community gets as much from the girls as they get from it. And the girls love Darien back. For more information on the ABC House, visit abcdarien.org.